These are the cutest rabbits one could imagine! They come in about 36 different varieties (more than any other breed!) all of which stay very small! This extremely cute bunny is easily one of the most popular show rabbits in the United States. It is also very popular in Europe where it is known as the 'European Pole'. Most of the time Netherland Dwarfs are happy, friendly little pets, but once in a while there will be one that becomes less agreeable as it approaches breeding age. During this time it may be more protective of its body and its cage. Usually the bunny will settle down and become friendly again if it is bred. However if you aren't planning on breeding, getting your bunny sterilized can often help avoid behavioral problems. There are also definite health benefits for the rabbit as well. Neutering or spaying can be done when your rabbit is over 4 months of age. Dr. Jungle..."Wow Leanne, thanks for sharing your Netherland Dwarfs!" Background: The Netherland Dwarf rabbits were developed in Europe and are thought to be based on the British Polish breeds. It is suggested that these early dwarf rabbits were seen in Holland, which is where they got the name "Netherland" dwarf rabbits. It was recognized as a breed in the United States in 1969. 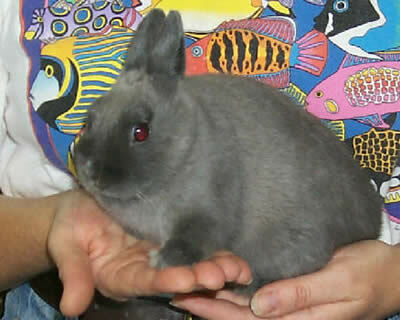 Description: The main feature of Netherland Dwarf rabbits is their small size. They have a similar appearance to the Polish dwarf, except that they are the smallest of all rabbits - weighing only 2 to 2 1/2 lbs. They are very compact, with short little ears that stand straight up. Their fur is short, dense, soft, and glossy. They are popular for showing and as pets. Color differences: Netherland Dwarfs rabbits come in all kinds of colors. There are currently 24 colors recognized by the American Rabbit Breeders Association. Some of the colors include black, blue, chocolate, lilac, lynx, opal, otter, silver marten, tan, fawn, and steel, as well as the white red-eyed (ruby-eyed) and blue-eyed. I have had my dwarf rabbit about two weeks he already potty trained. I just put the corner pan in and he used it himself. He comes right to the door when I open it and trys to climb to me. I just love him. Hi my name is Vanessa and I am looking to purchase a Netherland Dwarf rabbit as a Christmas gift for my son. The only problem is that I can't seem to find anyone that is selling this kind of rabbit. I am located in the Huntsville, Alabama area and I am very serious about this purchase. Please someone contact me if you are looking to sell a rabbit or know someone that is looking to sell. Thank You.